In addition we offer a number of complementary services, including company formations and secretarial assistance, access to an extensive on-line business library, tax business newsletters and investment advice through Alderwick James Financial Services. Our team is passionate about helping you succeed and hope that passion is reflected in every interaction we have with you. 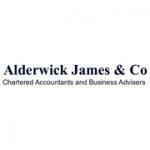 Alderwick James and Co is a professional accountancy practice located in the Royal Borough of Kingston upon Thames. We provide a full range of accountancy taxation and business consultancy services to individuals and small to medium sized businesses. For many individuals and businesses tax is a major expense. We can make sure that you pay no more tax than is necessary by making full use of the claims and allowances available and avoiding unnecessary liabilities. We have a range of services to support and help you grow your business. We can help you make the most of your wealth through a mixture of tax planning and investment advice tailored to your individual family circumstances. We use our expertise and experience coupled with the latest software packages to help you comply with all tax and accounting requirements relating to your business or personal affairs. In doing so we make sure that documents are filed and tax liabilities are paid by the appropriate dates in order to avoid penalty and interest charges.